First of all, I have to share some sunrise images from North Beach. It’s one of my favorite places in the world. At first light it is so quiet and peaceful. 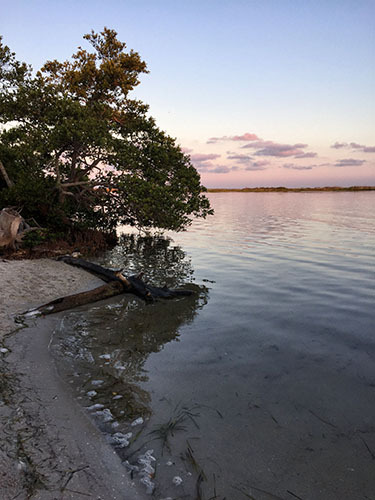 I love to dip my toes into the water as I walk along with my camera. On this particular morning, the sky glowed pink and a few clouds glowed on the horizon. It was so pretty. 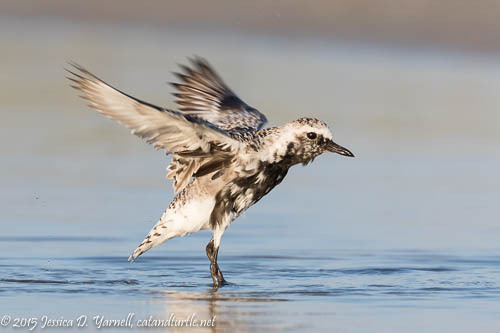 A Black-bellied Plover walked along the surf and showed off his black belly. You have to come just before they leave in order to see one in full breeding colors. In the wintertime, these plovers sport a drab grayish plumage. 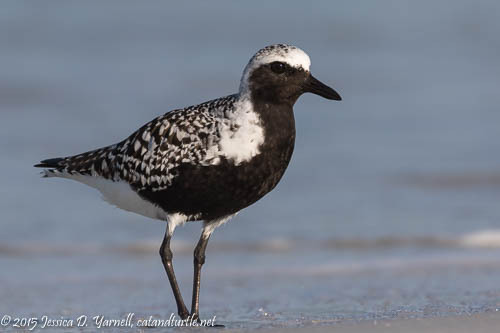 Last year I wrote about my attempts to find a Black-bellied Plover in full breeding plumage. This year, it was easy! Another plover was still in the process of molting. He enjoyed a nice warm bath in the Gulf. They are such fun to watch as they splish and splash in the water. Then they give you a nice wing-flap! 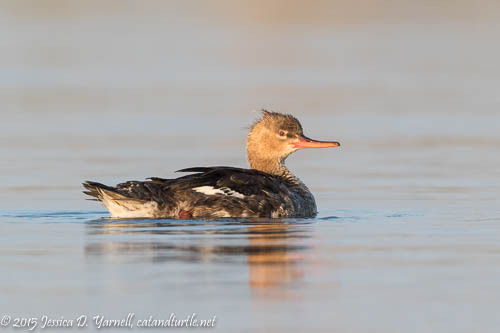 A few Red-breasted Mergansers were still hanging around. Again they met me in the surf right next to the beach as I crossed the bridge and stepped onto the beach. Then I found another one swimming in the lagoon. She was pretty swimming in the early morning light. 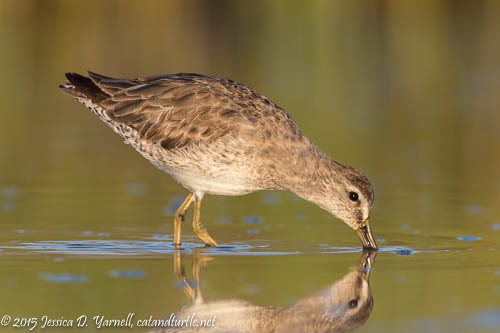 A Short-billed Dowitcher was digging for his breakfast in a small tidal pool. The green grasses in the background cast a pretty reflection in the water. This bird isn’t yet in his reddish-brown breeding plumage. There weren’t a whole lot of birds in the lagoon area. I sat in the ocean for a while, photographing the birds that were there, mostly Wilson’s Plover and a few sandpipers. 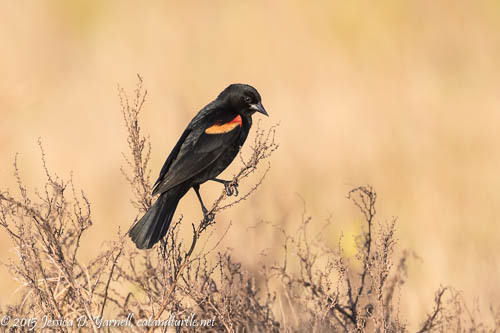 A Red-winged Blackbird caught my attention as he perched on some vegetation and sang with all his might. Then I meandered down to the water’s edge and tried to photograph the little peeps as they ran along the waves. They are fast! It’s hard to catch them on a good angle when all they do is run! 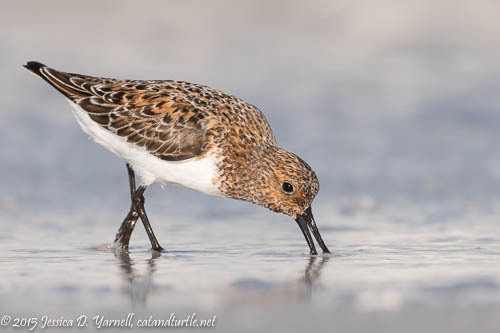 This little Sanderling is looking very nice. In the wintertime he’s basically a white bird. Not in the spring! 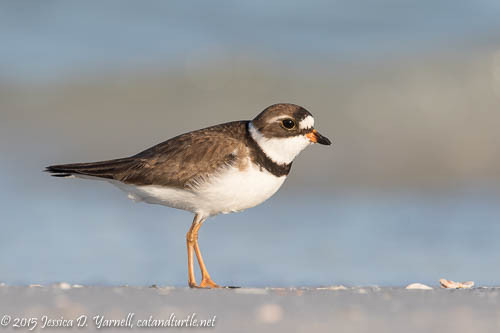 I was walking along the beach and found my big surprise of the morning – two Snowy Plovers were standing at my feet! 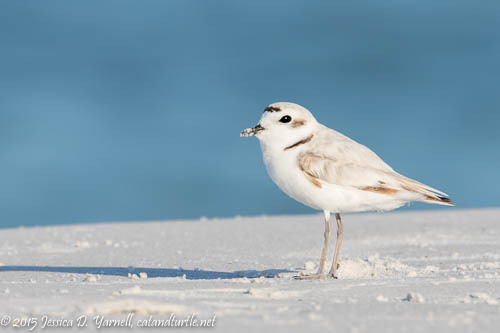 I’ve only seen a Snowy Plover once before, last fall at Fort De Soto. That bird wasn’t in breeding plumage, and this pair was. They let me take a few quick photos before they flew off. A pair of American Oystercatchers spent the morning combing the beach for food. I had too much lens! So I tried to capture some head shots. 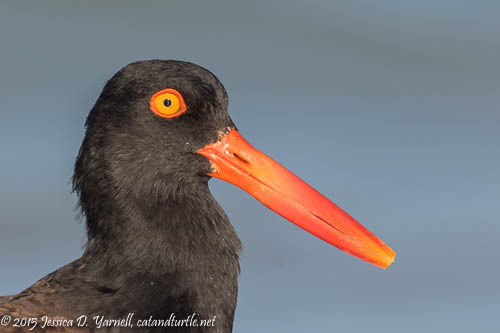 Look at that orange eye that matches his orange beak! As the beach started to fill with people, the birds and I headed for the hills. 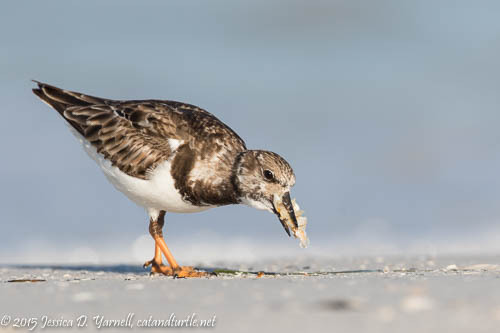 As I left, I found another Ruddy Turnstone with his beak full of breakfast – this time, I think it was crab. He seemed to be enjoying it! He told me not to miss him too much, because he’ll be back in Florida before I know it. It’s amazing how these birds leave in early May and then return in August. In that short time, they fly farther north than most people ever go, raise their babies, and return. No wonder their winter feathers look a little worn! Wonderful, relaxing post! 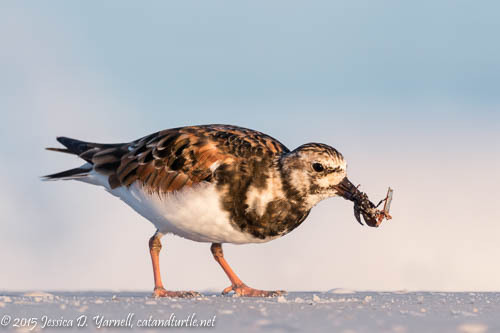 Congratulations on the Snowy Plovers! I’m still trying to get them in their Spring wardrobe.